My “DIY Conditioning Bar with Cleansing Properties” is a mix that my hair LOVES! As the name indicates it helps to condition my hair while leaving my curls feeling clean (thanks to cleansing properties) but it does not result in dry or stripped clean hair thanks to the conditioning elements! Note: *If you are pregnant please do not use any Essential oil. Essential Oil needs to be sufficiently diluted & certain oils have more “strength”. ** If you hair does not like Glycerin skip this ingredient (see Alternative Suggestions for other options). I first combine the dry ingredients (powders) together and mix them well. I then add the water and stir before adding the butter and remaining ingredients. When I add the butter and oils etc it is done step-by-step (do not pour everything in one go since you want to make sure you are not adding more than you want and to make sure everything is mixed well). If you are going to use this right after making the mix, then skip this step and move onto “Adding Your Mixing Liquid” (below). If you are making blocks, pour into silicon molds which will be covered with cling film in order for them to set (Once set, I store mine in a sandwich bag for future use). Depending on your preference you can basically add any liquid of choice (e.g. Flax Seed Water, Tea, Water, Coconut Milk, Coconut Cream). First gently double broil the blocks (do not completely melt them down) you just want them to melt a little since you will be adding warm mixing liquid which will completely melt down the bars. My mixing liquid of choice is Flax Seed Water. I literally let the seeds (2 oz) just reach a gentle rolling boil in plain water (8.8 oz) for no more than 5 minutes on low heat. I immediately sieve the seeds (which I store for reuse) and pour the Flax Seed Water to my semi melted blocks and stir stir stir. Once the Flax Seed Water has been added it turns into this lovely consistency and I highly recommend applying on lightly damp hair (best on detangled hair to avoid tangles and to allow for easy application). I cover my hair with a shower cap and scarf for a minimum of 20 – 30 minutes and then rinse it out with a dab of conditioner (the conditioner is optional but I prefer using it to make sure I don’t have any “bits” in my hair). Amla – holds conditioning properties, provides shine, strengthens the hair, helps slow down early on set greying/darkens the hair (subtly), helps keep a clean & healthy Scalp. 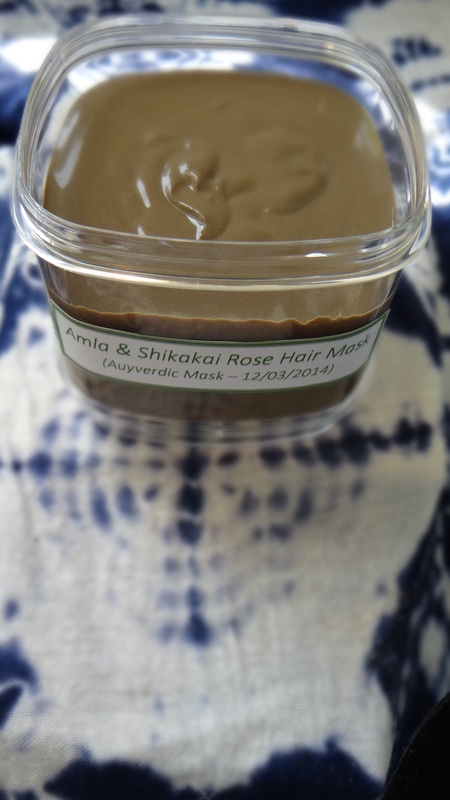 Shikakai – helps to cleanse the hair & scalp. Water – best moisturizing ingredient. Unrefined Cocoa Butter – helps moisturize the hair, reduces hair loss, reduces breakage & alleviates scalp itching and irritations. Virgin Coconut Oil – provides shine and strength, penetrates into the hair shaft to strengthen from within, soothes an irritated scalp & helps elimate frizz. Vitamin E Oil – helps extend homemade products shelf life, rejuvenates and offers protection for the scalp & hair. Peppermint Essential Oil – helps to stimulate blood flow to the scalp which results in hair growth, soothes an irritated scalp, cleanses the scalp & also helps extend the shelf life of homemade products. Glycerin – a humectant that attracts water in the air (humidity) to the area applied. 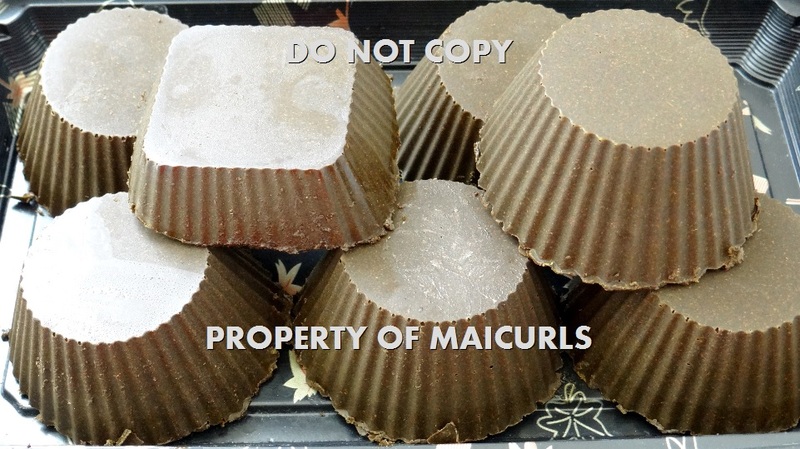 Unrefined Cocoa Butter – can be replaced with any other butter of choice e.g. Shea Butter, Mango Butter or a combination. Virgin Coconut Oil – can be replaced with any carrier oil of choice. Glycerin – can be replaced with Honey or Agave Nectar (if you hair likes Humectants). 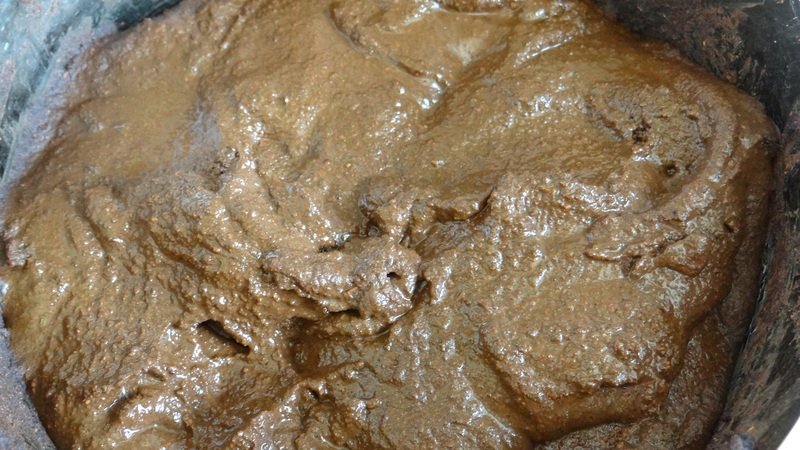 Shikakai – can be replaced with Aritha (soap nut) which has even more cleansing abilities. Water – can be used together with Rose Water e.g 0.35 oz Water & 0.35 oz Rose Water. Peppermint Essential Oil – you can replace this with any oil of choice or omit it completely. There is no “time frame” for this, you can use it whenever you like. I do suggest that if your hair is in need of a little TLC and you want to switch between deep conditioning you can use this in place of a Deep Conditioner from time to time. I would love to hear what you think! If you use this recipe or change a few things please let me know, I would love to hear from you! 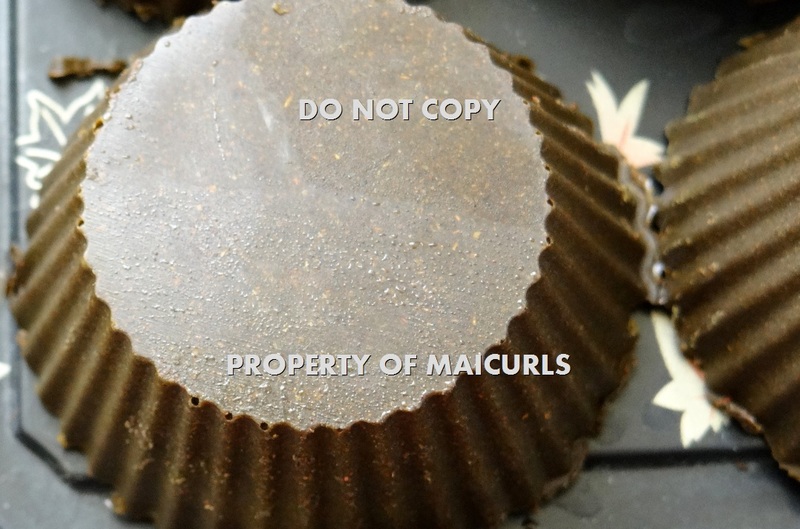 This entry was posted in Amla for Hair, Ayurvedic Hair Mask, Ayurvedic Herbs for Hair, Cleansing Bars For Hair, Cocoa Butter, Cocoa Butter for Hair, Coconut Oil for hair, Conditioning Bars for Hair, Flax Seed, Shikakai, Unrefined Cocoa Butter and tagged Amla, ayurvedic, Ayurvedic Herbs, Ayurvedic herbs for hair, cleaning natural hair, Cocoa Butter, Coconut Oil, Conditioning bar, Conditioning bars with cleansing properties, conditioning natural hair, DIY, DIY Hair Bars, DIY hair care, DIY Natural hair care, glycerin, Glycerine, how to care for natural hair, how to condition natural hair, Moisturizing natural hair, natural hair, natural hair care, Shikakai, Unrefined Cocoa Butter, virgin coconut oil on July 6, 2016 by Maicurls. 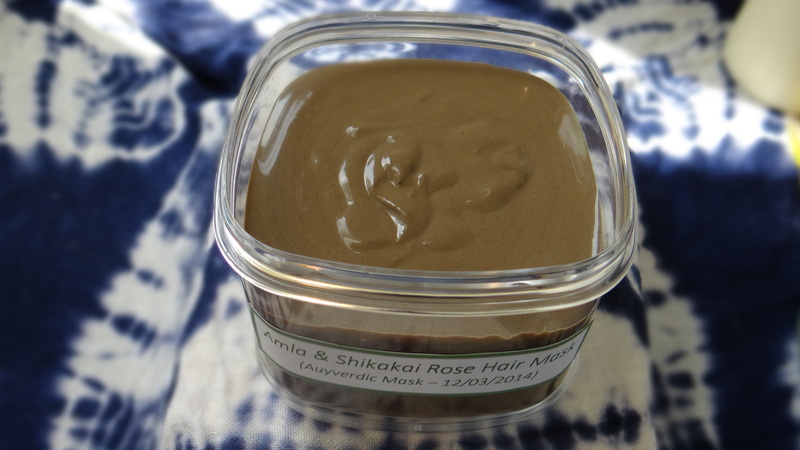 I first want to share my updated henna paste (full strength henna) which focuses only on ayurvedic herbs – Henna, Amla and Hibiscus mixed with Green Tea. This mix is somewhat similar to my “old” henna paste which you can read about (here) except that I now add hibiscus. I have already written about the wonders of hibiscus here p.s. it is awesome for a number of different reasons! Another aspect that is different is that I keep my henna paste “clean” by not adding anything additional e.g. conditioner, coconut milk etc after I see dye release. There is no harm in adding conditioner/coconut milk/oil etc to the paste, they actually help to make your hair feel less dry after you rinse out the henna however, at the moment I am more focused on the ayurvedic benefits which is why I opt not to add anything to the mix. (I turn to my DIY Henna Gloss Bars on days when I want to henna without the punch that is packed in my full strength henna paste). I first combine all the dry ingredients and then add my warm green tea (not boiling hot – I let it cool down first) and stir. I like making my paste quite thick because I don’t like the henna to drip down my face/neck. After mixing I will cover the paste with Clingfilm and wait for dye release. When I start to see dye release I add a tiny bit of lukewarm tea (no more than 1.5 oz) just so the paste isn’t too thick and will spread easily on my hair. It usually takes my henna no more than 4 hours to see the initial stages of dye release and I like to apply it when I start to see dye release since I leave the henna on overnight and the dye will continue to release while I sleep. I always apply henna on damp detangled and cleansed hair, starting at the back working my way to the front. I cover my hair with Clingfilm, a shower cap, sometimes a plastic bag and then a scarf to make sure everything is really nice and warm. ALWAYS USE GLOVES otherwise your palms and nails will get stained! After I have left the henna on overnight I rinse out the henna with water first, follow up with rinses with conditioner and then I apply a Moisturizing Deep Conditioner (DC) once the water runs clear. I leave the DC on for no less than 2 hours and then I am done! I mix up quite a bit of henna and store it in my freezer waiting for it to be used. This makes it less time consuming in the long run since everything is ready and just needs to be melted. Whenever I have henna in my freezer, the red dye is much more intense compared to when I just use my paste after dye release. 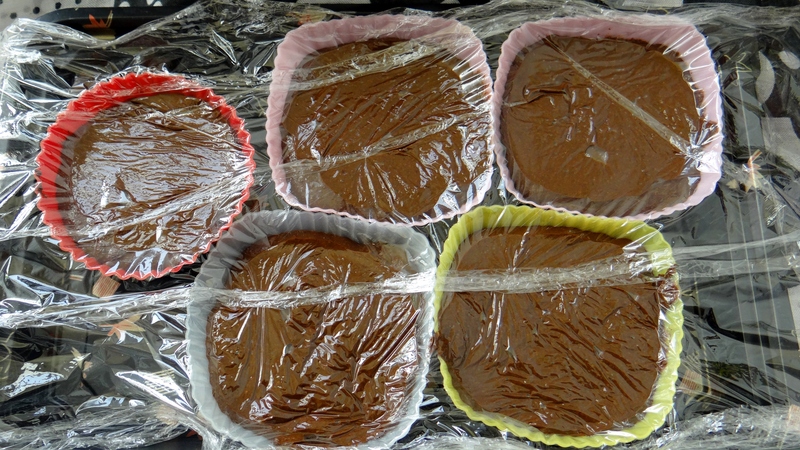 After making the henna paste I simply pour the paste into silicone molds, cover with Clingfilm and then place them in my freezer. 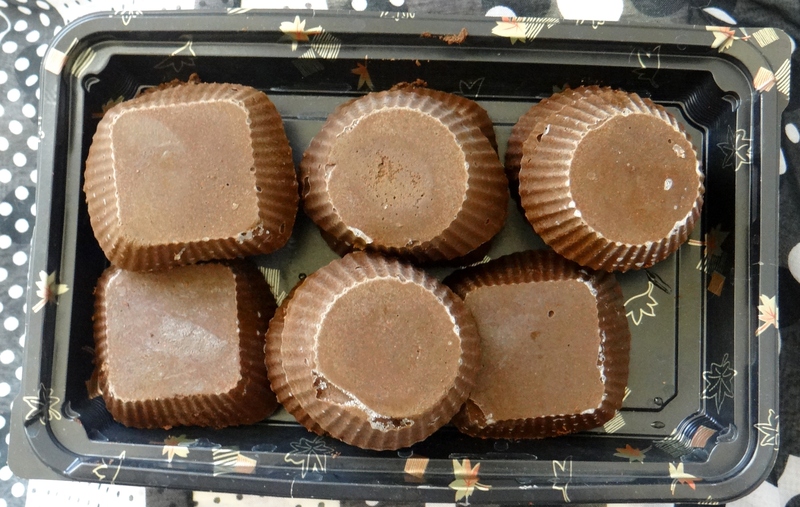 (If you do not have silicone molds you can use ice cube trays but I would keep the moulds and ice cube trays separate from those you use to make normal ice blocks, bake etc. I keep everything I use for my hair separate from other tools in my kitchen). I recommend letting the bars freeze for no less than 12 hours ideally letting them sit in the freezer for longer because the longer you let them sit the more intense the red dye! Once the bars have frozen I cover each bar with Clingfilm and store them in a sandwich bag until they are needed. I have left mine in the freezer for 2 months and still got great dye release and conditioning benefits. (You might get away with more storage time but I have not tried). Put a pot on the stove with a little bit of water. Place the bars in the heatproof bowl and put the bowl over the pot. Allow the bars to slowly melt down on low heat for 7 – 10 minutes while stirring. Once the bars have melted I tend to add a little bit of lukewarm tea (no more than 2 oz) just to make sure the paste is neither too thick/thin. I apply & rinse as normal (see above) and that is it! 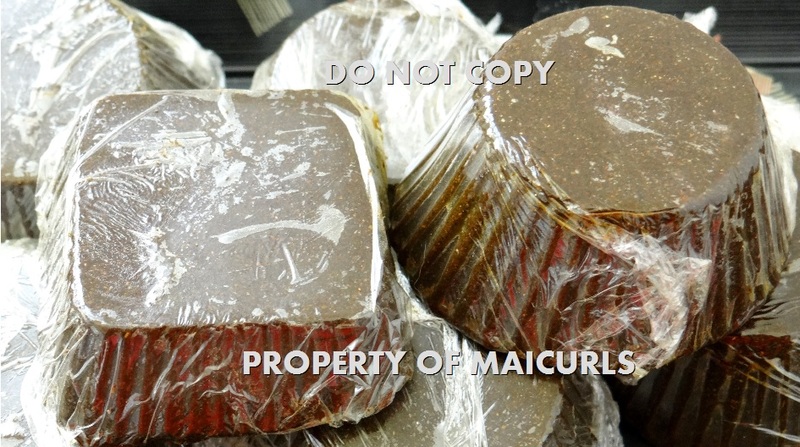 This entry was posted in Ayurvedic Herbs for Hair, Henna and tagged Amla, ayurvedic, ayurvedic henna, Ayurvedic Herbs, Ayurvedic herbs for hair, BAQ, BAQ Henna, conditioning natural hair, Frozen Henna, Frozen Henna Bars, Frozen henna blocks, Full Strength Henna for hair, Henna, Henna for hair, Henna for natural hair, Hibiscus, natural hair dye, natural henna, natural red dye, Strengthening Natural hair on July 27, 2015 by Maicurls. Today I am super super excited to share another DIY product and I am happy to say it has been added to my list of favourites! 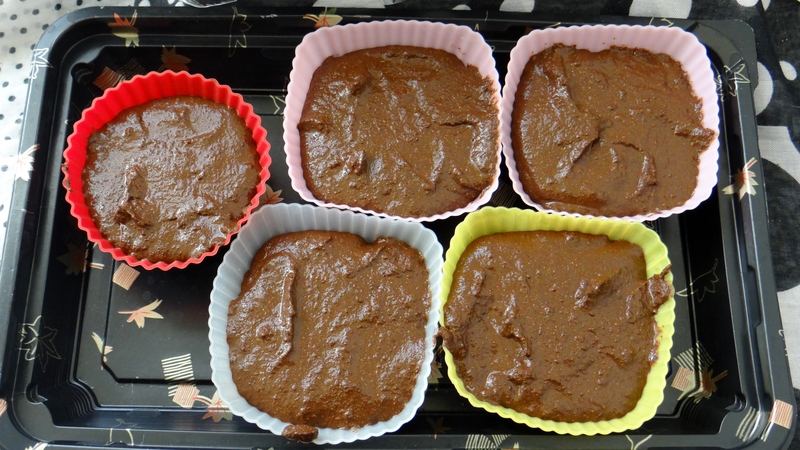 YUP, I finally worked out a mix for these DIY Henna Gloss Bars that I am really happy with. A while ago I started experimenting and wrote a quick post about it here. In my previous experiments I used too much oil, then too much butter but I finally have a recipe that is right (for my hair). Here are some pictures of my previous experiments. They look pretty but didn’t feel quite right. I have quite long hair that is fine but I like to coat my hair with henna so you might need to tweak the ratios depending on the length and density of you hair. *These powders can be replaced with other Auyverdic herbs such as Shikakai, Bhrami etc depending on the results you want to get. They are acidic which help with the dye release of the henna. First melt the Cocoa butter in a double broiler for no more than 5 minutes. After the butter melts take it off the stove, add the oils together and stir. Slowly add the melted butter and oils to the powder step by step and stir really well. Pour the mix into your moulds (I use silicon moulds since the bars are easy to pop out once frozen but you could use ice cube trays). Cover the henna with cling film to allow the dye release process and freeze them for a minimum of 12 hours. *Don’t use any metal items when mixing henna. – This is a precaution in case you are not using 100% pure BAQ Henna (which you should be using). If you know you are using 100% pure BAQ henna then you do not have to worry, I use glass and plastic items just to “set an example” but I am sure the henna I get is pure. I like to cover each individual bar once it has set with cling film and then place them in a resealable sandwich bag that is dated so I remember when the bars were made. Always store the bars in the freezer otherwise they will start to melt and will slowly loose their properties over time. You can keep the bars in your freezer for weeks, I actually always find that henna stored in the freezer has a stronger dye potency so I leave mine in the freezer for no less than 1 week before I use them. However after a while you might notice that the dye peak has started to drop. This is really about personal preference but I like to use either Coconut Cream or Conditioner (depending on what I’ve got at home) when I double broil the henna bars. Never use direct heat on the bars e.g. do not put them in the microwave or in a pot directly on the heat of a stove! While I make 6 bars I only use 5 bars for a full strength henna treatment and 0.5 – 1.5 bar for a henna gloss. The extra’s are left in the freezer for future use. Coconut Cream/milk: I use roughly 1/3 cup of coconut cream. I first double broiling the bars and then add the coconut cream, adding a little more (if it is too thick) and apply onto damp cleansed and detangled hair. I prefer my mix to be a little on the thicker side so it won’t run down my neck. Conditioner: I use 1/2 cup of conditioner (depending on how thick the conditioner is). I first double broil the bars and slowly add the conditioner a step at a time and mix. I apply onto damp cleansed and detangled hair. I prefer my mix to be a little on the thicker side so it won’t run down my neck. Tea: I use roughly 1/3 cup of green tea (you can use any tea). I first double broiling the bars and then add the tea. I apply onto damp cleansed and detangled hair. I prefer my mix to be a little on the thicker side so it won’t run down my neck. I tend to leave the mix on my hair for 30 minutes – 1 hour but you can leave it on for more/less time. I cover my hair with a clingfilm, a shower cap, usually a plastic bag as well and then a scarf just to make sure it is nice and toasty warm up there. *NOTE: ALWAYS do a moisturising Deep Condition (DC) after applying henna on your hair to restore the balance. Henna can make the hair feel dry and brittle therefore the moisturising DC brings back moisture to the hair. I like to use the bars in between the times I use my regular henna paste because it is a little less drying, it is easier to rinse out and to be honest I LOVE making the bars! 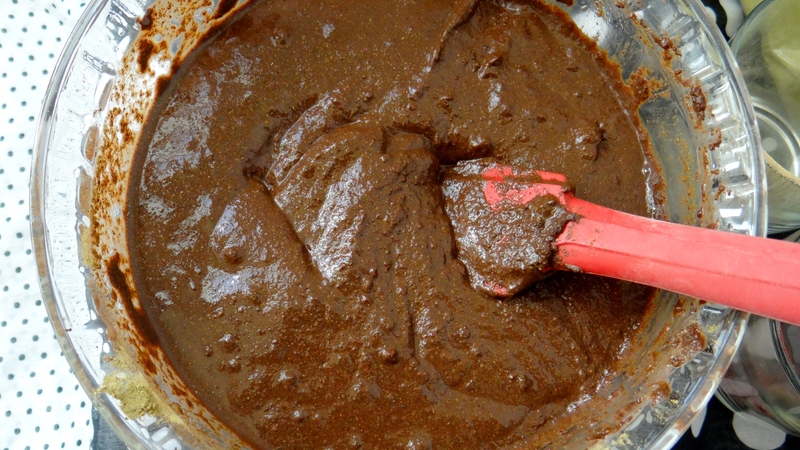 I still use my normal henna paste (recipe here), I just alternate between the two. I also like to use the bars as a gloss that gives my hair a light colour touch up and due to all the conditioner I use, my hair doesn’t feel as dry afterwards. I would LOOOOOVE to hear if you try this out and if you come up with your own recipes! If you use a pre-made Henna bar please let me know what you think about that, I love hearing from you all! 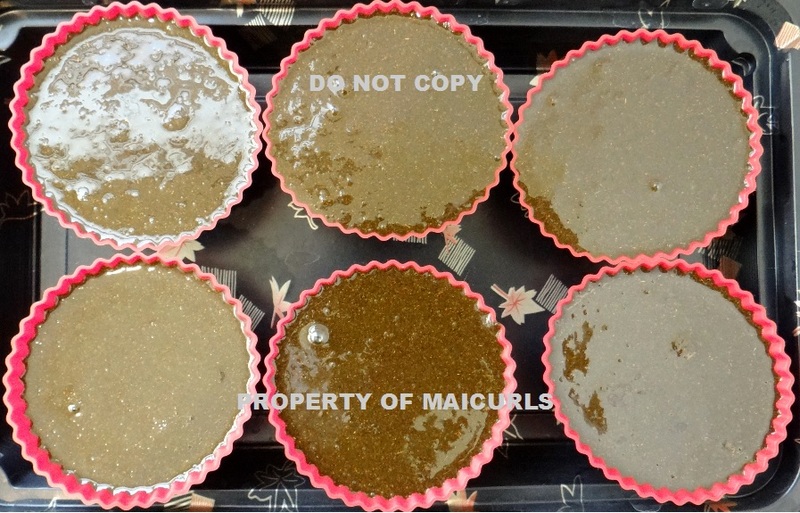 This entry was posted in Amla for Hair, Ayurvedic Herbs for Hair, Henna, Henna Gloss, Henna Gloss Bar, Hibiscus for hair and tagged DIY Henna Bar, Henna, henna bar, Henna for hair, Henna for natural hair, Henna Gloss, Henna Gloss Bar, Henna to condition hair, Henna to strengthen hair, How to make Henna Bars, natural hair, natural hair care on May 4, 2015 by Maicurls. 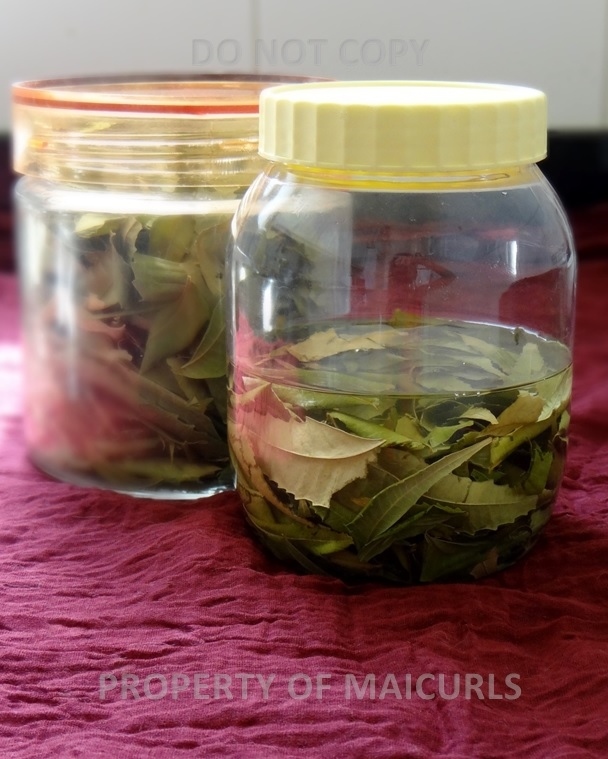 Today I want to share a DIY Hair Mask (Masque) with you. I actually started using this as a alternative to a Clay Mask (Masque) since I can’t seem to get the Clay here locally so I will probably buy some at some point to try experiment with and write about. But for now this is my baby! Now what is in this wonder mask I hear you asking right? Well the recipe is simple and as always is built around ingredients I use regularly on my hair. You should be able to find most of these in your grocery store (perhaps the “ethnic” section), your local Indian store or if all else fails you can find them all Online. Butters-n-Bars is a good place to check, as is Sheabutter Cottage and if you find a good reliable source Amazon is another alternative. I am able to find all the ingredients used locally. (NOTE: I was not paid, compensated or requested to mention any company names these are just suggestions of places where you can purchase some of the ingredients. I bought my products locally and paid for them with my own money). Essential Oils (EO’s) – you can use any Essential Oil you like. I am currently always in the mood of Rose water so I am not adding any EO’s to mine. Cassia – in place of the Amla you can replace it with Cassia which will not darken your hair. It has conditioning properties just like Amla as well as strengthening abilities. Other Ayurvedic Herbs – you can actually replace the Shikakai with any other herb such as Aritha, Brahmi, Neem just to mention a few. 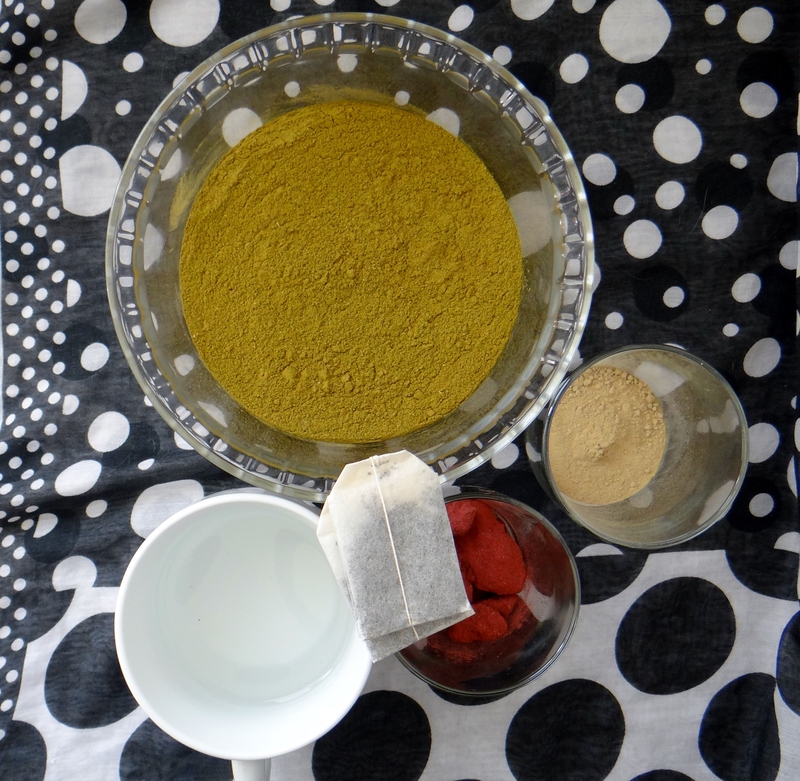 I first combine the Ayurvedic Herbs together in a bowl and mix. Stir it carefully because they powders are really light and will fly around everywhere. Next I add the Oil, Glycerine and Rose water and stir again. The final step is adding the water. I like to add the water a little at a time and mix. You might want to add more/less water depending on how thick/thin you want the mask, I like mine to be a little thicker than pancake batter. 1. I first dampen my hair with a spray bottle, I like my hair to be damp but not sopping wet. 2. I apply the mask liberally all over my hair starting at the ends and make my way to my roots. (Do not comb or manipulate your hair once it is applied because otherwise you are asking for breakage!) 3. I wrap my hair around my head and cover with a shower cap and usually some material too to keep my head warm and leave it on for 30 – 60 minutes. 4. I rinse out the mask and *co-wash my hair. * For some the Amla might be a little acidic and therefore can leave your hair feeling a little rough and therefore a simple co-wash might not sufficient. If that is the case do a moisturising Deep Condition afterwards. I make a lot of this mask and use it all up because I like to coat my hair with it and my hair is a little long. You might need more/less depending on your hair length/density however if you have any leftovers you can cover and store it in the freezer just make sure to put a date on it to remember when it was made. This entry was posted in Amla for Hair, Amla infused Grapeseed Oil, Amla infused oil, Ayurvedic Hair Mask, Ayurvedic Herbs for Hair, Ayurvedic Oil for hair, Hair Mask/Masque, Rosewater for Natural Hair, Shikakai and tagged Amla for natural hair, Amla Hair Mask, Amla hair mask for natural hair, Amla Infused Coconut Oil, Amla Shikakai Rose Hair Mask, Amla Shikakai Rose Hair Masque, Ayurvedic Hair Mask, Coconut Oil for natural hair, DIY Ayurvedic Hair Mask, DIY hair care, DIY Hair Mask, DIY Hair Masque, Glycerine, Hair Mask, Hair Masques, natural hair, natural hair care, Rose Water, Shikakai, Shikakai Hair Mask, virgin coconut oil on April 14, 2015 by Maicurls.